Ring in the holidays, and make this Christmas Mulled Wine recipe infused with warm winter spices, apple cider, lemon, orange, and apple slices. This mulled red wine is so easy to make and makes the perfect Christmas drink! Christmas Mulled Wine is a wonderful, traditional warm drink to serve at a holiday or Christmas party. Just place everything in your slow cooker or crockpot, or heat on the stove, and enjoy. It doesn’t get much easier than that! Throwing a little confetti over here today, because this recipe is published in a magazine! Here is our little story: Lidy Baars owner of French Garden House, asked for a Christmas drink recipe in the sizzling heat of summer, last July. She was writing a magazine article for the holidays. French Garden House is an online boutique that specializes in beautiful French antiques, entertaining, design, and lifestyle inspiration, and is often published in magazines. On that hot summer day, I got the giggles as I shared a warm winter holiday drink recipe with Lidy, and guess what happened next? We found out we were published in the Winter 2016 Holiday edition of Victorian Homes Magazine! More about our feature at the end of this post. For now… on to making these festive Christmas drinks! Step 1: Simmer all ingredients on the stove for 10 minutes. Step 2: Serve warm in glasses. Step 3: Garnish with orange peel and cinnamon sticks. TIP: Never boil your mulled wine! Keep it at a simmer. What Spices are in Mulled Wine? The spices in mulled wine recipes vary (see the next section! ), but my version includes cinnamon (sticks), cloves, and star anise. How Do You Make Jamie Oliver Mulled Wine? It sounds like a must-try recipe! What is the History of Mulled Wine? Mulled wine is also called glögi or glühwein. It originated in Scandinavia as a spiced liquor and was used by postmen and messengers who traveled long distances on skis or horses. The spiced liquor helped warm them up in the frigid temperatures! Glögi is popular in Sweden and Finland and is made in both alcoholic and non-alcoholic versions. It is a very popular Christmas tradition in Finland! Try Santa’s Chocolate Chip Peppermint Cookies with milk chocolate chips, candy cane crunch pieces, and minty creme de menthe chips are a perfect cookie for the Christmas Holidays. Santa Claus will Ho Ho Ho when he sees these cookies piled up! Pile freshly baked cookies on a Peppermint Plate (Candy Plate) for Santa, or take to your Christmas Party! My favorite holiday recipe ever is this Sausage Stuffing with Cranberries and Cherries! It is so good that people will be scooping second helpings. Assemble a Christmas Coffee, Tea, and Hot Cocoa Bar for your guests who want festive drinks without the alcohol. This is such a cute and easy display to put together! For your guests who want to enjoy a Christmas drink or two but are following a low carb or keto diet, serve them Hibiscus Cocktails! They are low in sugar and SO good. 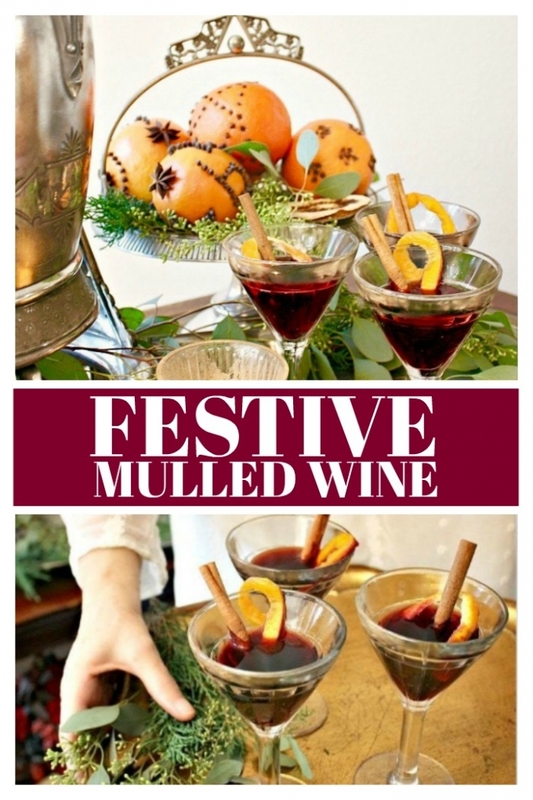 More from our Mulled Wine Recipe Feature! The article in Victorian Homes features Lidy’s gorgeous home, beautifully appointed with her signature French Antiques plus ideas on decorating with fresh natural materials for the holidays and her fabulous entertaining tips. Lidy writes articles for leading home design magazines such as Victoria, Southern Lady, Victorian Homes, French Country Style, Cottage Gardens and is currently featured in three of those magazines! Intertwine fresh garlands with natural materials such as eucalyptus, juniper, holly, berries, mistletoe, pine, and rosemary. Add citrus fruits like tangerines or oranges. Layer some more with fresh greens and sprigs of natural materials. Try to use what you have growing outside, and clip from your own garden! I love these jewel tones, so pretty, festive, and easy! Thanks again Lidy, you are a sweet dear friend and a wonderful mentor. Oh, how we love to collaborate on delicious new recipes, table settings, and ways to entertaining in style! Happy Holidays, Merry Christmas, and Cheers! Make Festive Christmas Mulled Red Wine infused with warm winter spices, apple cider, lemon, orange, and apple slices in a crock pot or slow cooker. A wonderful and traditional warm drink to serve at a holiday or Christmas party. Cheers! Or on low in a crockpot during a party. Garnish with orange peel and cinnamon sticks. It’s always so much fun to work with you on blog posts and magazine features Lisa! Thank you for this delicious recipe, and for allowing me to share it with the Victorian Homes readers….it proves that your name Delicious Table is very appropriate! Merry December!! I’m a little embarrassed it took me so long to leave a review for these… must be all the wine! 😉 Haha. But seriously, I served these this past Christmas and they went over so well. They tasted great and the addition of the cinnamon stick and orange peel really made them something special.